Formal photographic portrait of James Thomson Bottomley, head and shoulders, full face. Bottomley held the post of Demonstrator of Experimental Physics at the University of Glasgow for 29 years. He published works on dynamics and hydrostatics. Bottomley was the nephew of physicist William Thomson, 1st Baron Kelvin (1824-1907). 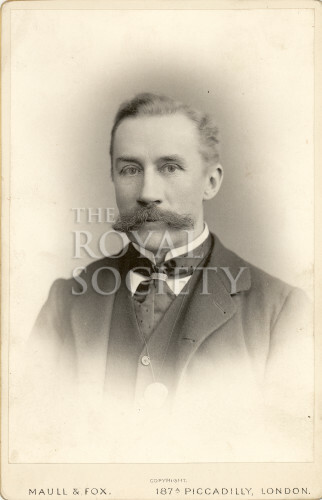 Bottomley was elected a Fellow of the Royal Society in 1888. The Royal Society holds approximately 600 photographic portraits of Fellows taken at Henry Maull studios between the mid-nineteenth century and the early twentieth century.